We like us some Bradley Cooper, and “The Crow” remake seems to be in good hands, but Bradley Cooper as “The Crow”? Cooper is Relativity Media’s first choice to take the lead role in “The Crow,” reported Variety. This would continue the relationship between star and studio that began with “Limitless,” which opened in March and has made $64 thus far. The news comes hot on the heels of the announcement that “28 Weeks Later” helmer Juan Carlos Fresnadillo had been hired to direct “The Crow” remake. Cooper recently met with Fresnadillo to discuss the project, and the director apparently liked Cooper’s thoughts on the lead character. We were underwhelmed by “Limitless,” but impressed by the range and versatility that Cooper displayed in the film, as he transitioned seamlessly from dirtbag to Wall St hotshot to pol over the course of the film. But this seems like a bad fit—maybe it’s the bad juju that hangs over the film as a result of star Brandon Lee’s tragic death during filming, maybe it’s the idea of cooper in the make-up… who knows, just seems like a bad idea. The Wolfpack is back, this time in Thailand for a wedding brunch, which we can only assume from Stu's tattoo went about as well as the party in Vegas. It's a teaser, and frankly, there ain't a lot of meat in that sandwich, but we're still psyched. The film opens May 26. But, hey, if we knew anything about the magic of Hollywood, we wouldn’t be sitting here in our mother’s basement. 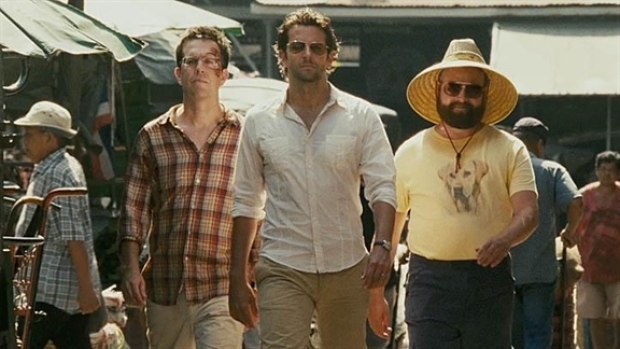 Cooper’s next film “The Hangover Part II,” opens May 26.